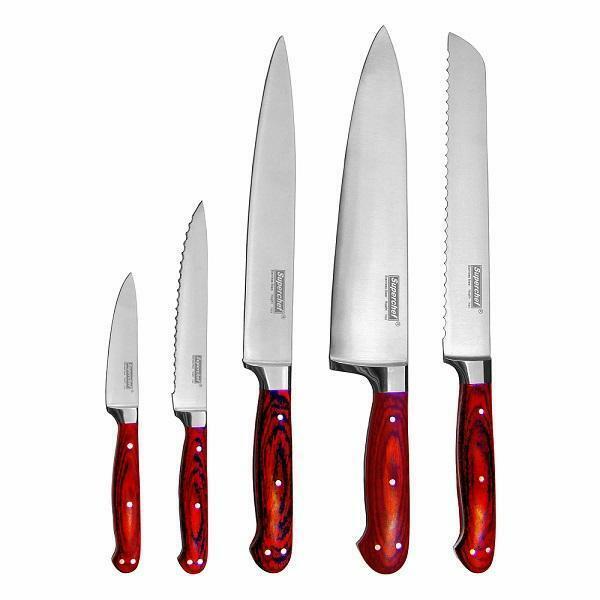 5-pc Kitchen Knife Set | Pakkawood Handle with Jagged End(KET-121) - Keywood International Inc. This 5-pc knife set has a jagged end on its handle. It is perfectly suited for all purposes. The set consists of: chef's knife, carving knife, bread knife, utility knife, and paring knife. The wooden handle is made of pakka wood, with layers of wooden stacked together for a perfect radiance from the wood grain. The handle is dense and compact, deterring any water damages, while avoiding the splitting that is common in other wooden materials.